The Bruno Elan Straight Stair Lift provides the quality you need! 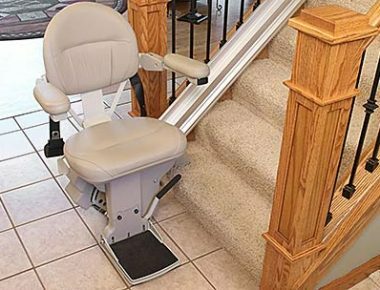 For navigating stairs in a two-story home or a single story home with a basement, the safe, smooth start and stop features of the Bruno Elan straight stair lift ensure maximum mobility. 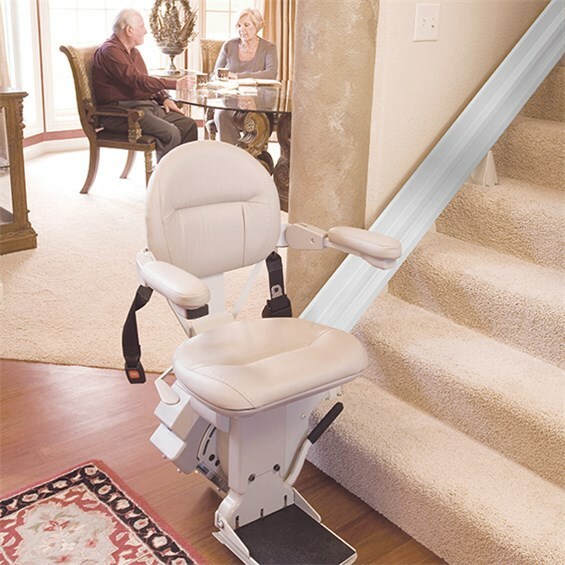 The straight stair lift is designed to move up and down one straight flight of steps. 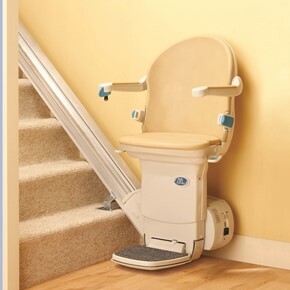 The stair lift fits directly to your stair treads, not to the wall. 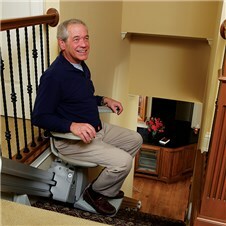 This is the simplest stair lift design and most economical stair lift available. The lift can be ‘called’ or ‘sent’ up or down the stairs whenever it’s needed, making it easy for multiple users to control. allowing for smooth stair passage for others. The swivel seat turns and locks in either a 45° or 90° position, helping you to get in and out of your stair lift, easily and safely. 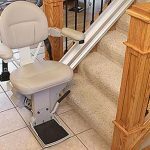 In situations where two flights of stairs meet at a landing, as a cost-saving measure it is sometimes recommended that there be one straight stair lift installed for each flight of stairs, with the user transferring from lift to lift at the landing. With a weight capacity of 300 lbs, the Bruno Elan straight stair lift comes standard with a large seat with multiple height adjustments, and is competitively priced at around $3350, including a home assessment, state certified installation, review and permit. 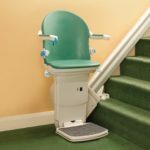 The Bruno Elan Straight Rail Stair Lift is priced around $3350 including a home assessment, state certified installation and review. The offset swivel seat makes getting off and on safe and easy for the rider. Obstruction sensors and seat belt ensure additional safety. Always prepared in the event of a power outage, the continuous charge strips exist along the rail power the unit wherever it stops. Two wireless call/ send units allow the lift to be controlled remotely. Two 12 volt batteries provide dependability — even in a power outage. The Bruno Elan straight rail stair lift offers a smooth ride from start to finish. The flip up arms, seat, and footrest create plenty of extra space on steps. The Bruno stair lift warranty is five years on major components and two years on parts. 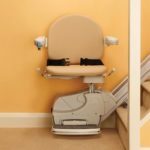 Contact Stair Lifts Atlanta, LLC by telephone at (770) 880-3405 and we will assist you with the selection and installation of a stair lift that is exactly suited to meet your mobility needs. Or, you may email us your information using the website contact form and we will call you.